IITC’s Paw Volume Meter enables researchers to measure the effectiveness of anti-inflammatory agents and agents to reduce edemic conditions. In use, the paw is inserted into plain water, which contains a special water cell of which the pressure is changed due to the immersion. This pressure change is calibrated in ml and shown on a special electronic monitor. This form of detection eliminates changes due to conductivity alterations at repeated insertions as found on comparable units. The measurements are shown on the units LCD readout in .01ml for rats and .001ml for mice. 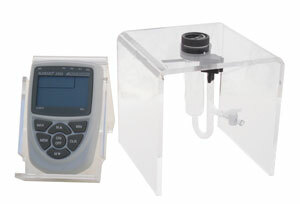 The unit is stable and can be safely operated either on its own battery or on a line adapter at 9 or 12 V. The unit is stable and can be safely operated either on its own battery or on a line adapter at 9 or 12 V.
An angled acrylic stand serves to keep the instrument in position for easy viewing. The water cell is attached to an acrylic stand of its own. The fact that there is no “wetting solution” required is a first for this type of unit. The unit also allows for obstruction free viewing of the test subject with free access to the cell.